Performance-based funding (PBF) for public colleges and universities is increasingly prevalent worldwide, as a part of a broader pattern of marketisation in public education. 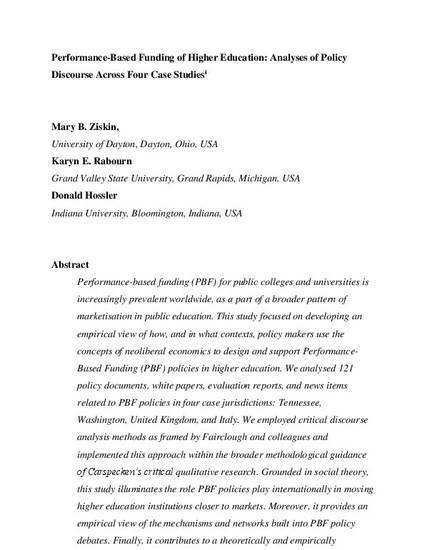 This study focused on developing an empirical view of how, and in what contexts, policy makers use the concepts of neoliberal economics to design and support PerformanceBased Funding (PBF) policies in higher education. We analysed 121 policy documents, white papers, evaluation reports, and news items related to PBF policies in four case jurisdictions: Tennessee, Washington, United Kingdom, and Italy. We employed critical discourse analysis methods as framed by Fairclough and colleagues and implemented this approach within the broader methodological guidance of Carspecken’s critical qualitative research. Grounded in social theory, this study illuminates the role PBF policies play internationally in moving higher education institutions closer to markets. Moreover, it provides an empirical view of the mechanisms and networks built into PBF policy debates. Finally, it contributes to a theoretically and empirically grounded view on the discursive uses of neoliberalism in education policy. The document available for download is provide in compliance with the publisher's open-access policy. Permission documentation is on file.